NEW YORK -- Citizenship Now! hotline is back for its 14th year, providing free and confidential citizenship and immigration information to thousands of callers. Permanent residents interested in becoming citizens will be referred to organizations that can help them with their applications at low or no cost. Others interested in becoming permanent residents, or in other immigration issues, will also be able to obtain information and referrals. This event has generated special interest during presidential election years and they expect this year's call-in to be one of the busiest ever. "In a campaign season where hostility toward immigrants has never been higher, we expect more calls than ever," said Editor in Chief Jim Rich. "Green card holders want to get U.S. citizenship in time to vote, and we are here to help them." 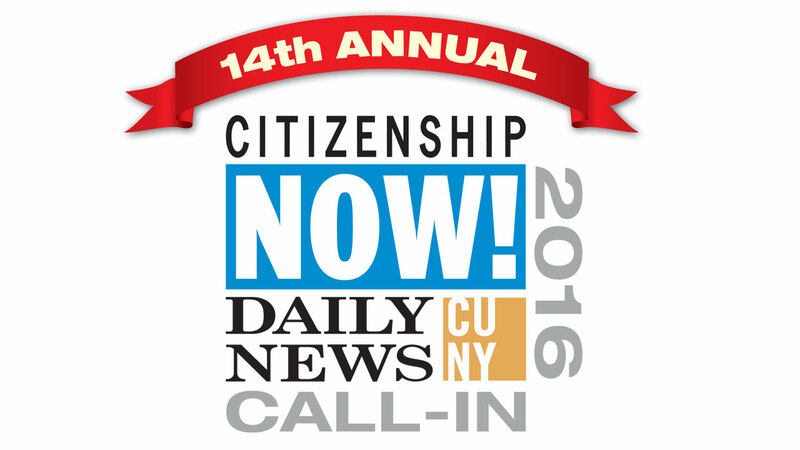 Citizenship NOW!, the largest program of its kind in the nation, was co-launched by the Daily News and CUNY in April 2004 to address the lack of access to free and confidential immigration information for the people who need it most. To date, more than 143,000 callers have sought information from the hotline as they travel the complex road to citizenship. This year's week-long hotline is operating from NOW through Friday, April 29 between 10 a.m. and 8 p.m., with more than 400 trained volunteers available by telephone over the course of the week. Calls will be answered in English and Spanish, as well as numerous other languages, including; Mandarin, Cantonese, Russian, Korean, Italian, Haitian Creole, Bengali, Polish, French, Yiddish and Arabic. The Citizenship NOW! hotline is led by attorney Allan Wernick who is also a professor of Law at Baruch College and writes the twice-weekly "Immigration" column for the Daily News. Additionally, Wernick writes the nationally syndicated column, "Immigration and Citizenship" and is the director of the CUNY Citizenship Now! program. "This year we are putting special emphasis on providing callers with information on how immigrants can qualify for U.S. citizenship," said Professor Wernick. "Our goal for the Citizenship NOW! call-in is to empower immigrant New Yorkers. Immigrants need to naturalize, vote and take charge of their destiny" he added. "We'll provide callers with information to help them overcome common barriers to citizenship like not being able to afford the fees or not feeling prepared for the English and Civics test."